The accessibility of locally stored files over the Internet can be of great convenience to many small business users, but the task of doing so without using a third-party service such as Dropbox isn’t always straightforward unless you have some networking know-how. 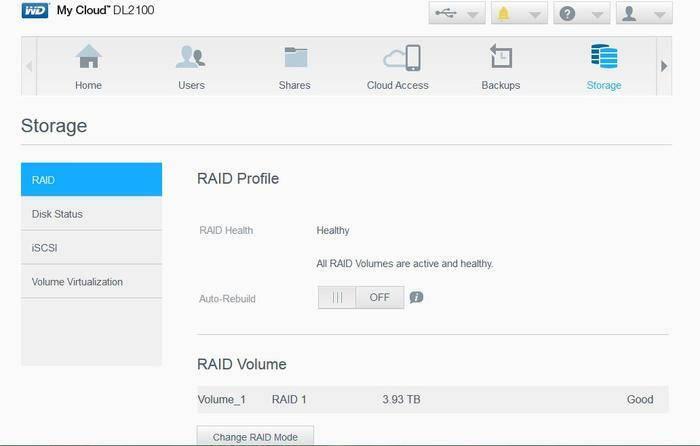 Many NAS devices are making it easier, though, thanks to automatic Cloud configuration options and desktop and mobile apps that are a cinch to use. WD’s My Cloud DL2100 is such a NAS device. Cloud access of your personal, locally stored files is the predominant selling point of this network attached storage (NAS) device, and you’ve probably already surmised that from the product name and our introductory paragraph. But we'll talk a bit about its other features first. It’s a 2-bay NAS with the ability to house up to 12TB of space via two 6TB. 3.5in SATA hard drives, though the model we are looking at here has 8TB of space via 4TB drives, and is set up in a RAID 1 array in order for the data to be duplicated across both drives -- so you get 4TB of actual storage space. The hardware is solid, with a case that’s made out of metal, and drives that are inserted in slots, rather than mounted on trays. WD supplies its Red drives for the pre-configured models of this NAS, but you can also get the case on its own and put in your own drives if you wish. The warranty is three years if you buy the NAS with drives already in it, and two years if you buy it without disks. A front-mounted USB port makes it easy to plug in external hard drives and thumb drives that you want to backup to the NAS (there is a backup button, too), while the rear has one more USB 3.0 port, as well as duplicate Gigabit Ethernet ports and power supply ports. The power ports are for redundancy (though the power supplies are external and similar to notebook power bricks), while the Ethernet ports are both for redundancy and load balancing. Without an LCD screen built in to the NAS (the 4-bay has a screen), you can’t just glance at it for its IP address after you plug it to your network and switch it on. However, the setup is aided by the ability of the NAS to be discovered through its name: simply type wdmyclouddl2100 in the address bar of your browser to get to its login page. 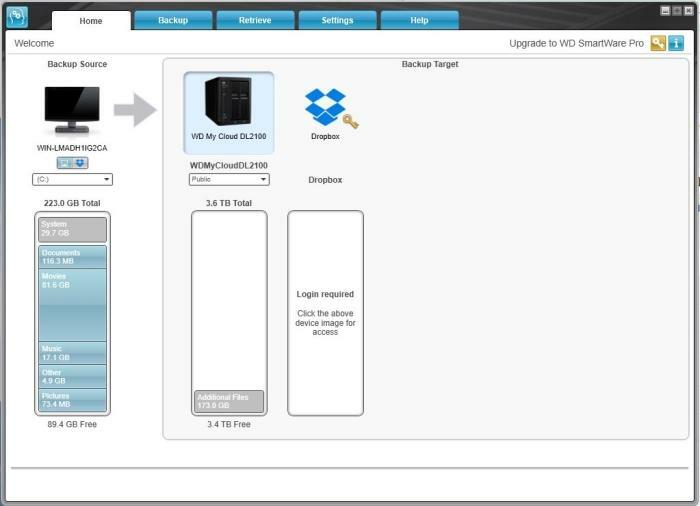 This means you can configure the NAS from a laptop or a tablet quite easily. The setup process includes the step that requires you to create a login for WD’s My Cloud site, which is the site that will keep tabs on the IP address of your NAS and allow you to access it from anywhere through an app or desktop. We initially had issues setting this up because we already had a WD account from previous reviews, but it worked okay when we created a fresh account. Once you get to its interface proper, you’ll find a layout that is one of the cleanest in the world of NAS devices. 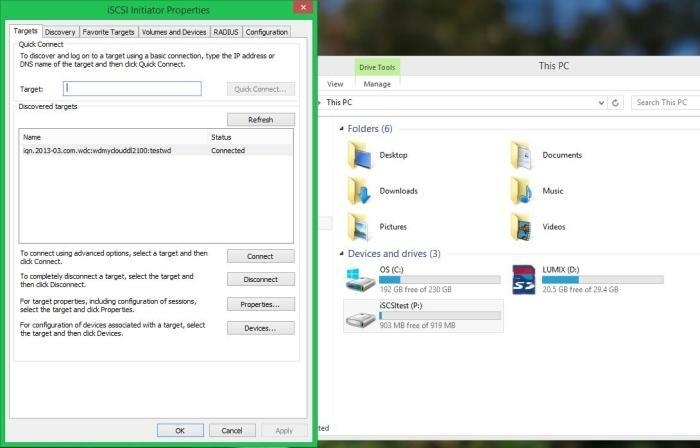 There is an at-a-glance snapshot of the system, which lets you know the status of your drive, how much space is being used, and how many users and devices are currently connected to it. You even get a rundown of the types of files that are consuming the most space. Across the top, there is a navigation bar for you to hop over to the various configuration areas of the drive so that you can set up users, add devices to the Cloud service, initiate backups, and perform other management tasks. 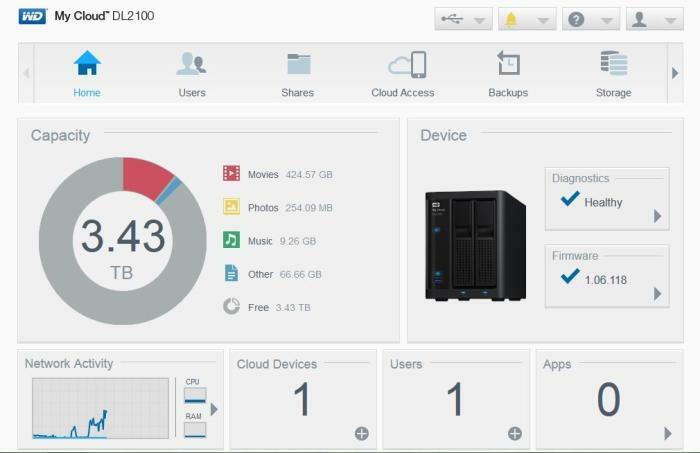 The main interface is clean and offers pertinent information about your NAS. Backups from computers to the NAS can be scheduled through Apple Time Machine or Windows Backup (or WD's SmartWare). The setup interface actually gives you some hints as to how this all works, and it’s part of WD’s attempt to make this NAS as easy as possible to understand for those of you who have never dealt with network storage before. You can back up the DL2100 to an external USB drive, or to another DL2100, and Cloud services such as Amazon S3 and Elephantdrive are supported. Using WD SmartWare to backup a PC. 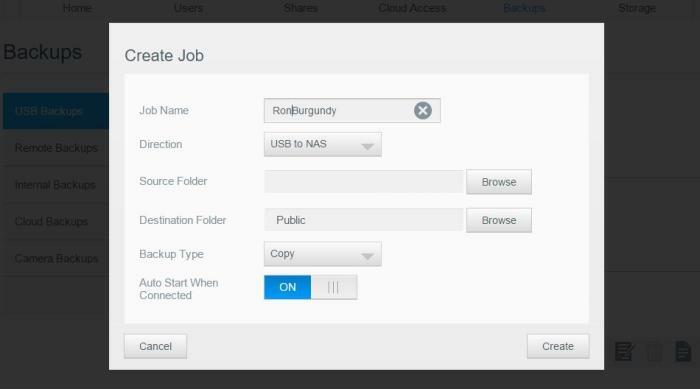 Once you set up a backup for your USB drives, you can simply press the button on the front of the NAS to copy data to the NAS, or backups can start automatically. Performance on our network using a Gigabit Ethernet connection between the NAS and a desktop computer resulted in impressive overall speeds. Large files (such as video files) were written to the NAS at a rate of 85.67 megabytes per second (MBps), and read from it at a rate of 102.13MBps. Small files (such as MP3s and FLACs) were written at 61.64MBps and read at 73.82MBps. 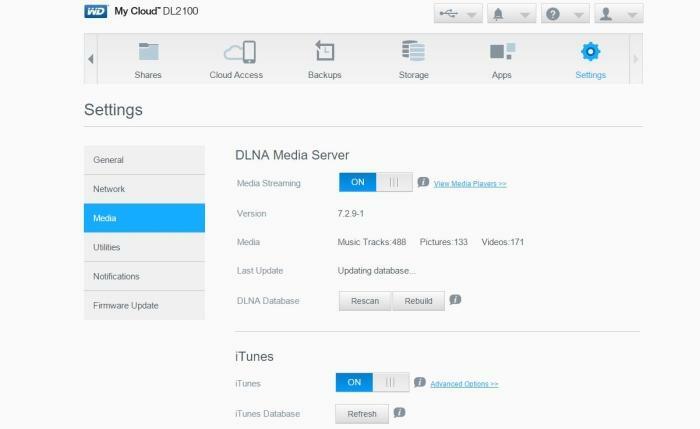 You can use the My Cloud DL2100 as a capable media server on your local network, too, with support for DLNA and iTunes built into it, and we had no problems playing content through a WD TV Live Media player, nor through a mobile device using a file manager such as ES File Explorer. Media streaming to all sorts of devices is possible. 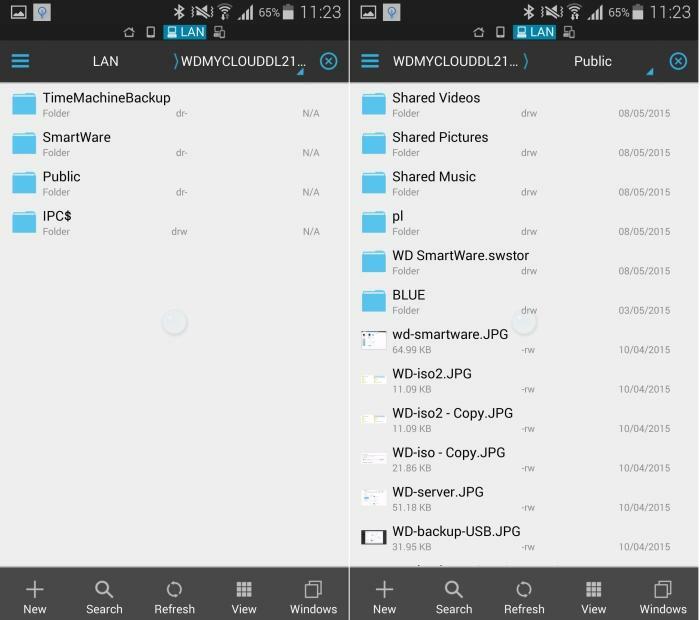 Viewing content from the My Cloud on an Android phone using ES File Explorer. App support is something that virtually all NAS devices offer these days, with vendors such as Synology and Asustor being particularly active in this area (and with richer offerings than most). Out of the box, there is a P2P torrent manager installed, and you can choose to add apps such as Dropbox, and WordPress if you wish. 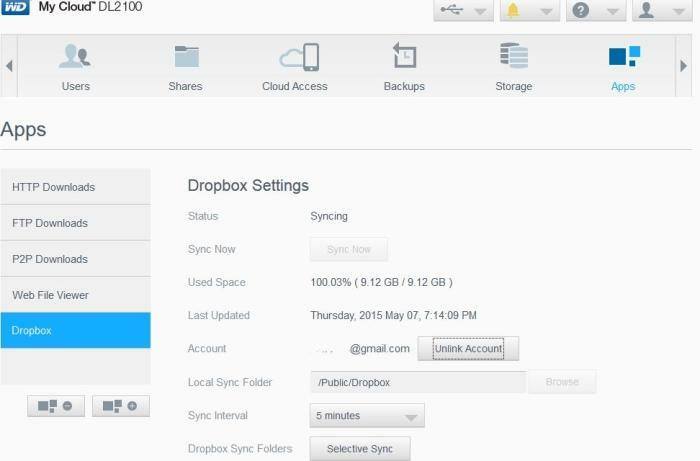 Dropbox is worth installing as you can then synchronise all data in your Dropbox account with your My Cloud NAS. However, extra apps definitely aren’t the reason to consider this NAS. You can add the Dropbox app to synchronise your files on your My Cloud. For more advanced needs, there is the ability to manage users and groups, you can set up virtual drives via iSCSI, there is Active Directory support, and link aggregation and failover (the dual Ethernet ports we mentioned at the start). If you have a need to mount ISO files in your work, this can be accomplished quite easily through the NAS, too, so that the image is then visible on your network and its contents accessible from any computer. Mounting an ISO file on the NAS so it appears on the network. As for Cloud access, this works in conjunction with apps. 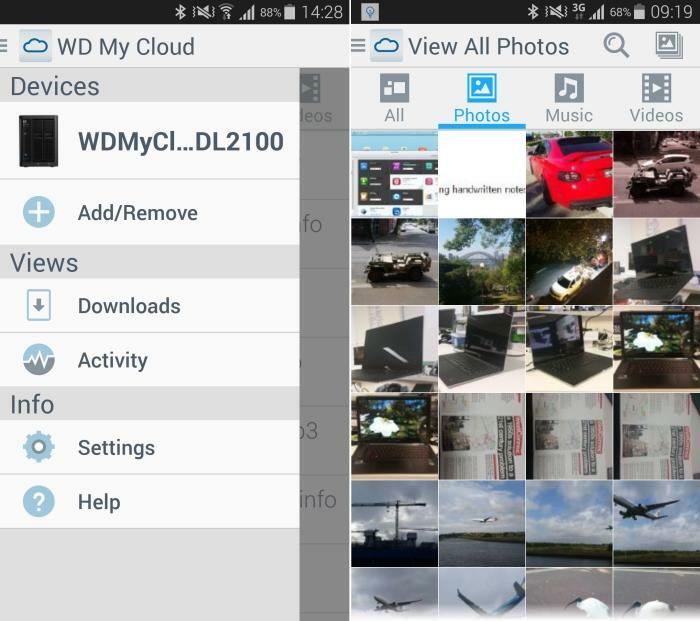 After you’ve created your account for the WD My Cloud service, which will keep track of your NAS on the Internet, you'll need to install a desktop client on all computers from which you want to access your NAS when you’re on the road, and you’ll also need to download the WD My Cloud app for your mobile devices. You can register mobile devices with the NAS device by using a code, and this is the method that we used with good success. It’s important to note that if multiple users will be accessing you’re my Cloud DL2100 remotely, then they will need their own login details for the My Cloud service, and then proceed to associate their devices with the NAS, too. WD's My Cloud app allows you to log in to the NAS while connected via Wi-Fi or through the mobile network. You can use it to access files on your NAS, such as the photos in our example. Where the Cloud functionality comes in handy is in situations when you want to access files that aren’t necessarily easy to carry on a mobile device or laptop. Things such as portfolios of photos, presentations, or perhaps music files you want to show off, these can all be accessed remotely on an as-needed basis, so you don’t have to carry them around your devices all the time; they will all be stored on your own personal storage device in your office. It’s a good drive to consider if you have a home office or small office environment that you want to keep in synch with data backups from your computers and mobile devices, and it can make remote access to data an easy thing to accomplish. Its interface is clean, we were up and running in a matter of minutes, and its performance on our network was swift.